It was a nice win, yeah. Tough loss, too. Mostly, though, the outcome was meaningless. 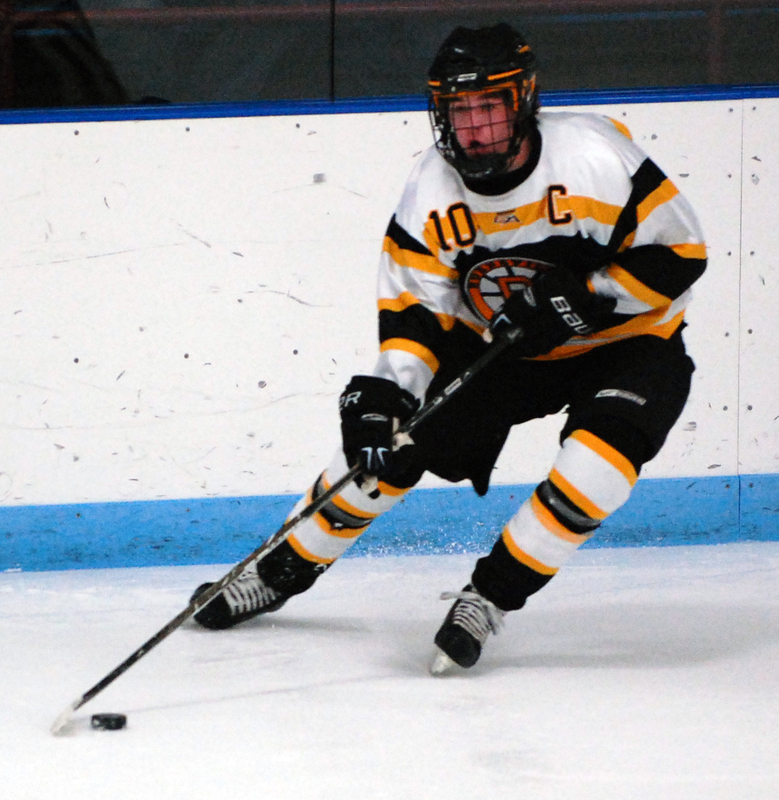 The Zamboni hadn’t finished circling the ice after Burnsville’s 3-1 triumph over Bloomington Jefferson in the regular season finale for both teams on Saturday, Feb. 20, at the Bloomington Ice Garden and already both teams had tossed the game aside like so much dirty laundry. Bigger, better things await the No. 9AA Blaze (16-6-3) and No. 6AA Jaguars (17-5-3). 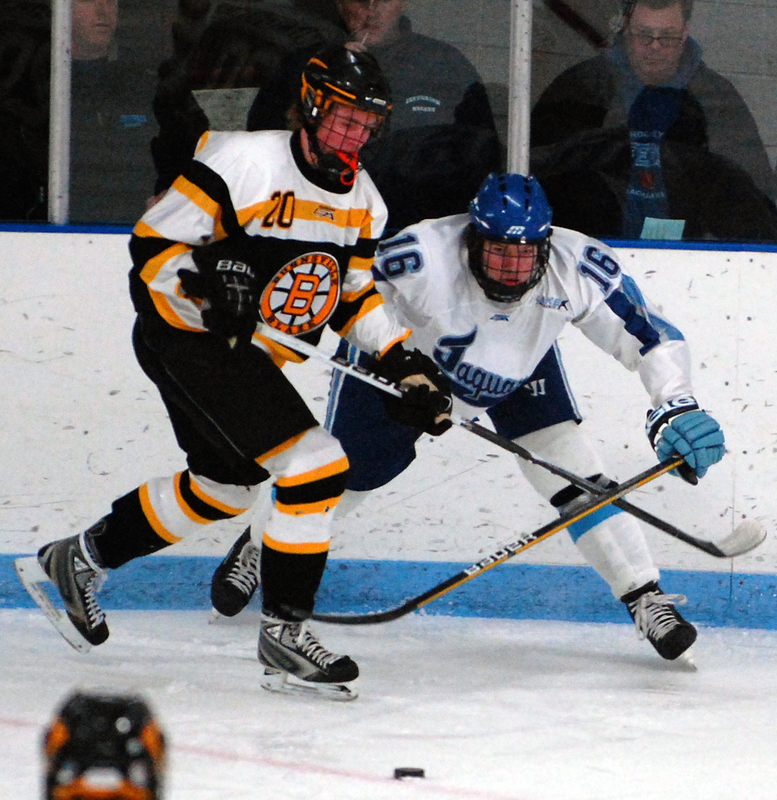 Namely, a potential semifinal rematch in the upcoming Section 2AA playoffs. “We wanted to finish up the regular season on a positive note, whether it was winning or losing, we just wanted the kids to come out and play hard,” Burnsville coach Janne Kivihalme said after the Blaze won their 10th straight. “So we were happy with the outcome, but we’ve got to make sure we stay focused, because now it is playoff time. 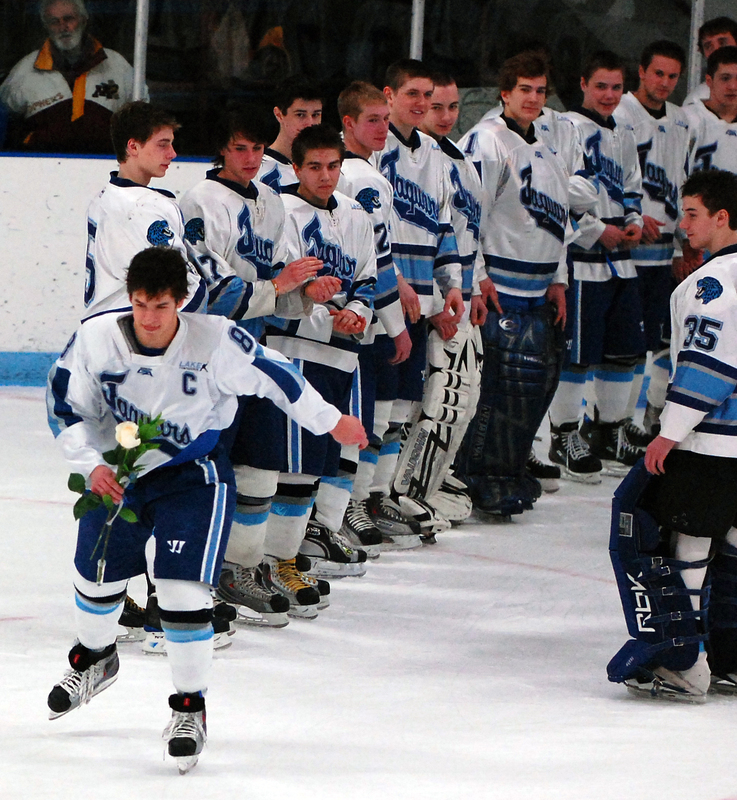 If the Sunday, Feb. 21, Section 6AA seeding meeting goes as expected, Edina will get the No. 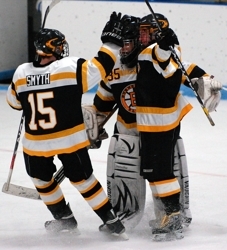 1 seed, Burnsville the No. 2, Bloomington Jefferson the No. 3 and Holy Angels the No. 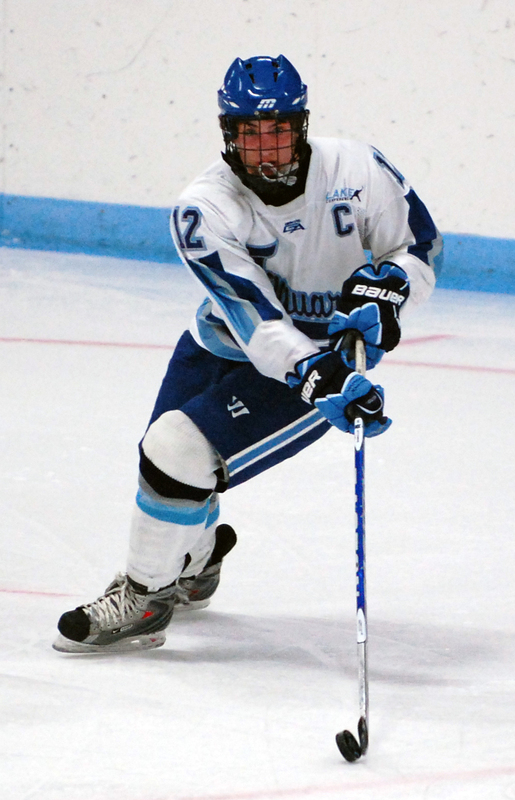 4 in what is generally considered the state’s second toughest big-school section behind the behemoth that is 6AA (Minnetonka, Wayzata, Eden Prairie, Benilde-St. Margaret’s and Hopkins). 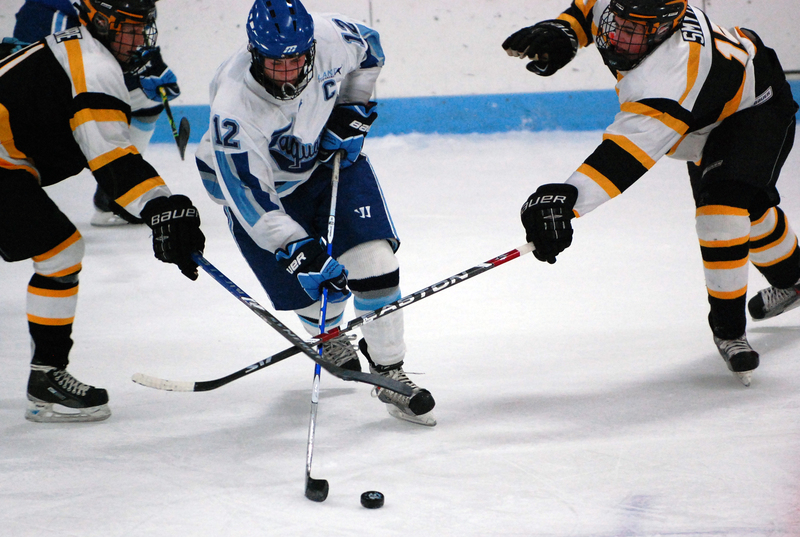 The consensus heading into the final day of regular season games was that Edina and Holy Angels were locked into the No. 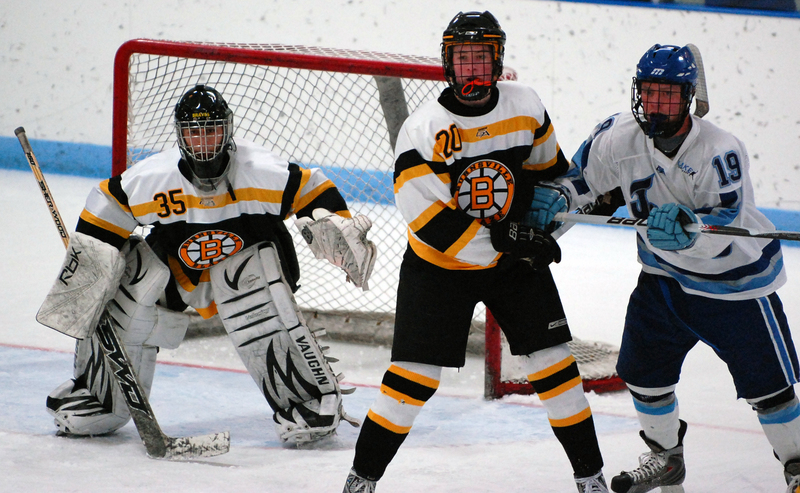 1 and 4 spots, respectively, and that the winner between Burnsville and Blomington Jefferson would get the No. 2. Since the semifinals will be played at neutral sites, all that was decided on Saturday between the Blaze and Jaguars was which team will get the final line change should they meet again. That, and Bodhi Engum is going to be extremely difficult to beat. 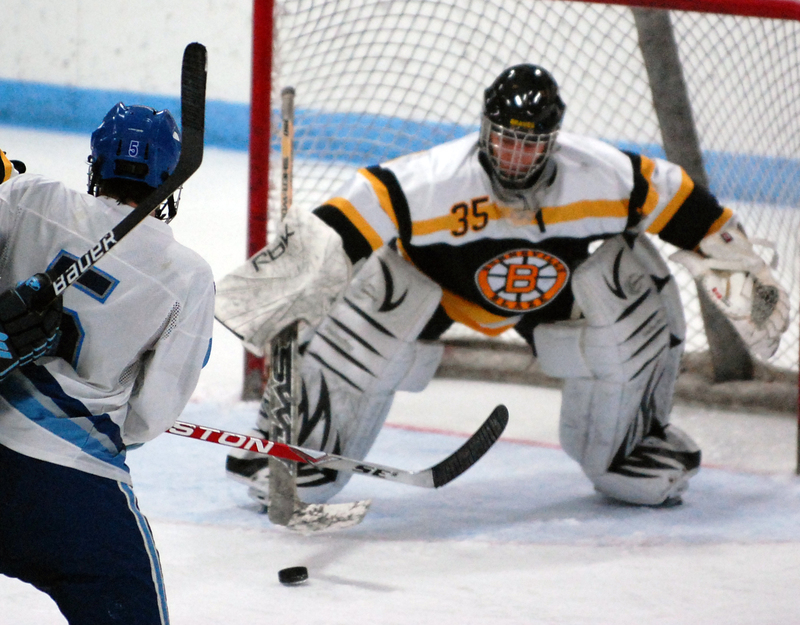 “That goalie for Burnsville, he’s pretty good isn’t he?” Jefferson coach Jeff Lindquist deadpanned after the game. 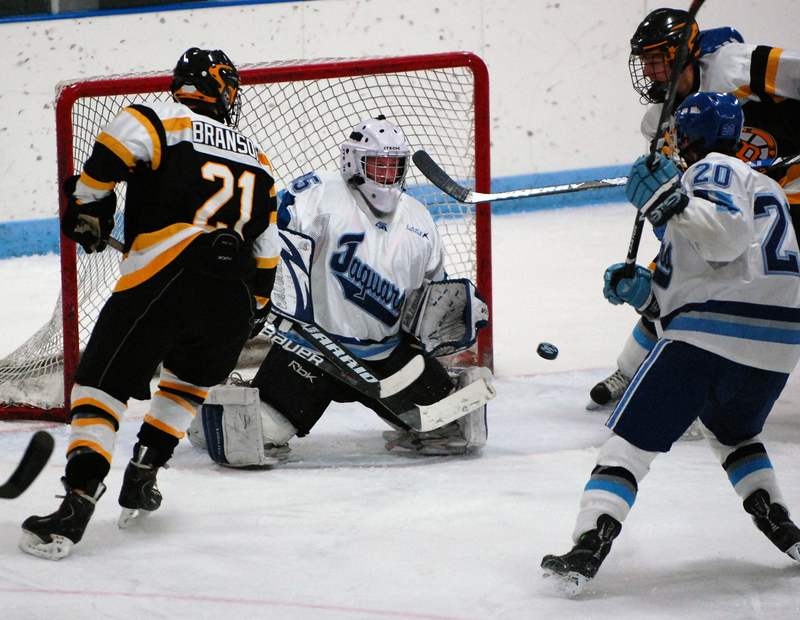 The Jaguars threw all they had and then some at Engum in the first period, when the Burnsville goaltender made 15 of his 29 saves. By the time Jefferson realized the only way to stop Engum from stopping the puck was to deny him the ability to see it, the game had all been decided. Even then, in the third period with a mountain of players stacked in front of him, the Blaze goaltender managed to make save after save, sometimes without ever seeing the puck. 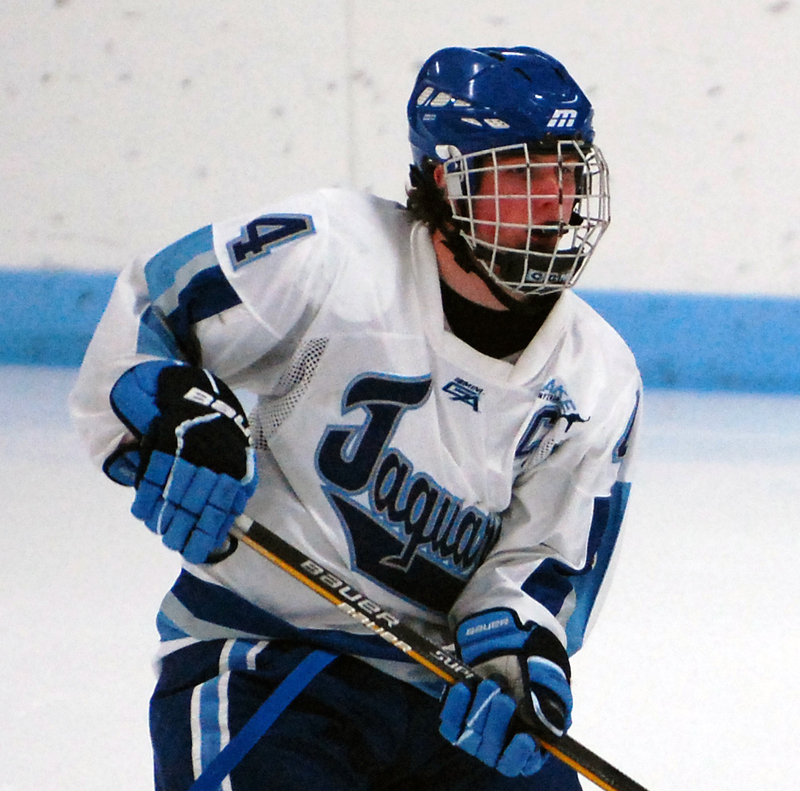 The diminutive Engum just missed getting his seventh shutout of the season when Jaguars center and Mr. Hockey finalist Caleb Herbert scored on a power play midway through the third period. That goal ended a streak of nine-plus periods in which Engum, who ranks fourth in the state with a .931 save percentage, hadn’t allowed a goal. The Blaze needed them throughout, but especially in the early going and again late in the third. “They outplayed us a little bit in there, quite a bit, actually, but we were able to get lucky on our bounces,” Kivihalme said. 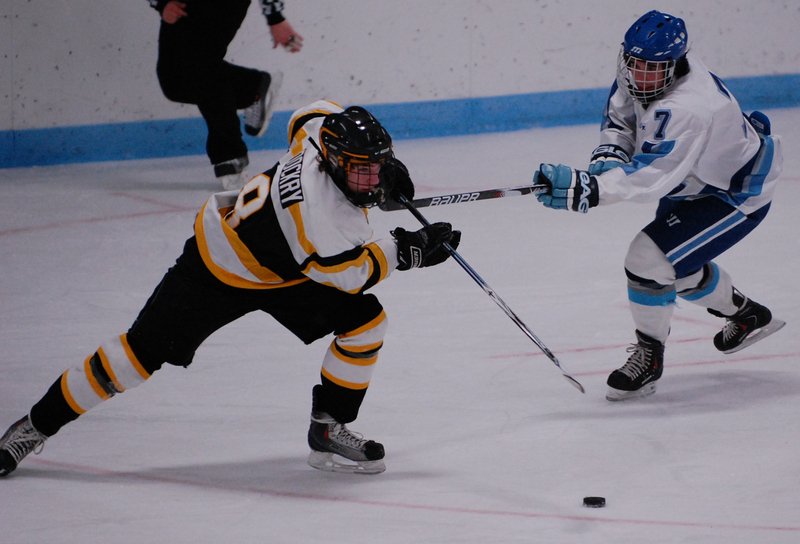 Burnsville was the definition of opportunistic, scoring on three of its first nine shots. 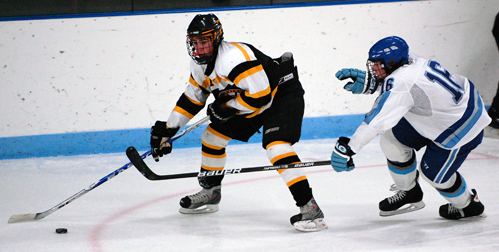 That’s a shooting percentage the Jaguars, who struggled to convert numerous chances in a 4-4 tie with Lakeville North on Feb. 18, would love to have in the playoffs. Junior goaltender (pictured below) once again played his angles to perfection, giving the Jaguars little to no open net to shoot at on most of their scoring chances. He did a great job of controlling his rebounds and, as an added bounus, made crisp outlet passes while acting as a third defenseman numerous times on Jaguars dump-ins. 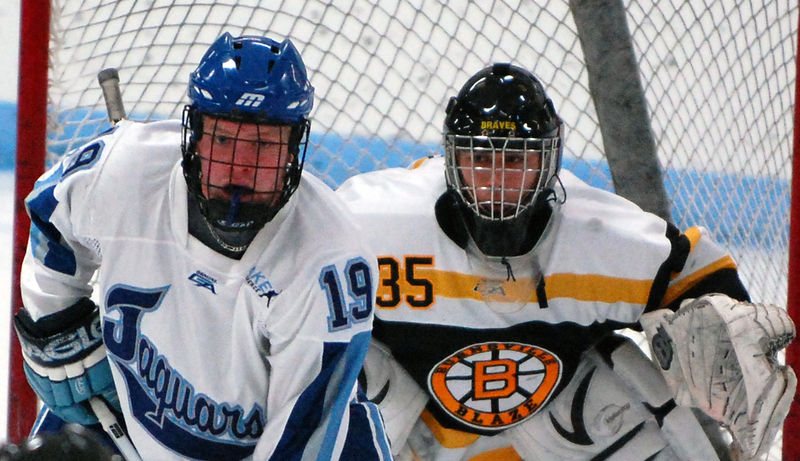 Junior forward scored the third goal for the Blaze on a perfectly placed shot, putting them up 3-0 and chasing Bloomington Jefferson starting goaltender Eric Fabano. Dupre, a converted defenseman, also was a backchecking demon who played responsibly in his own zone. 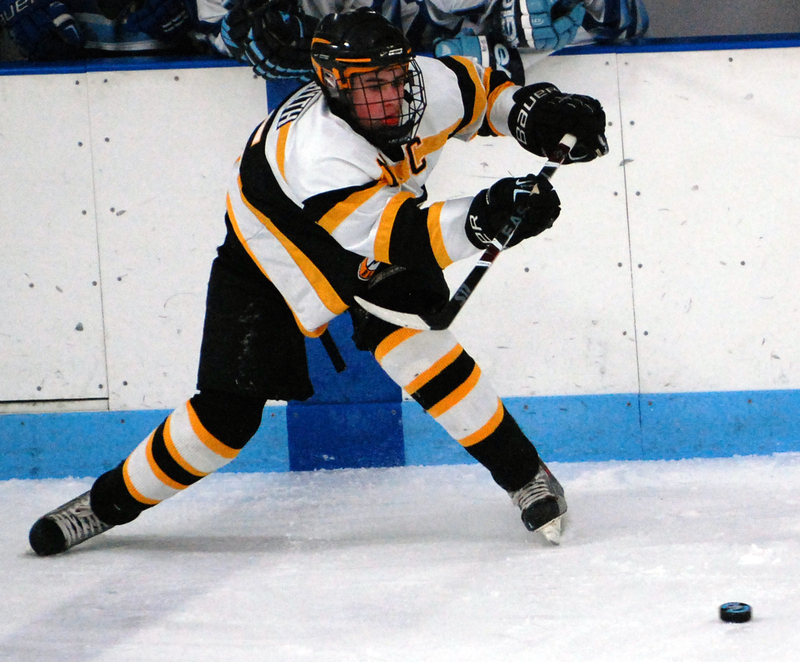 Senior defenseman had an assist on the lone Jaguars' goal and deserves mention if only because he revived a lost art by delivering a devastating open-ice hip check on Burnsville's Cory Chapman in the third period. 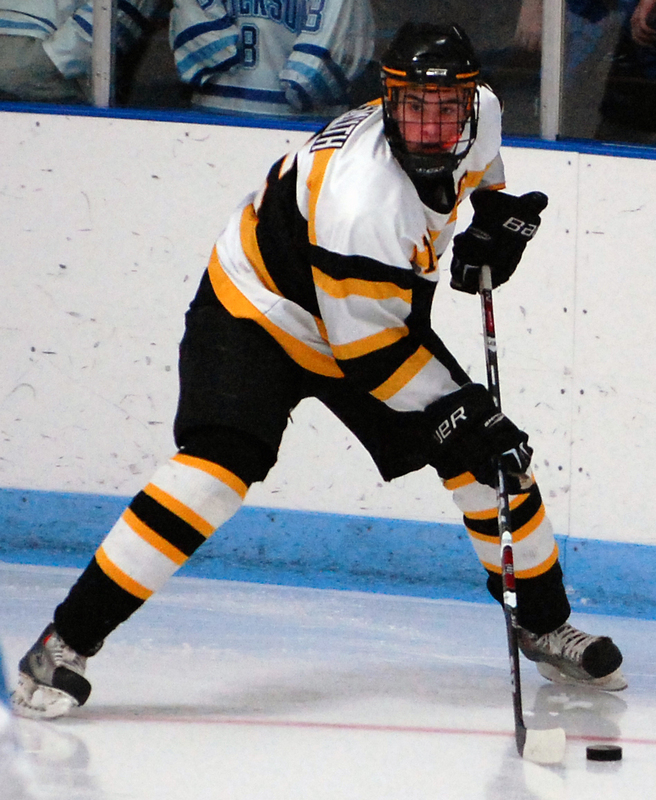 Aaron Dupre started the season on the Burnsville junior varsity as a defenseman. He was shifted to a forward position and, after injuries created an opening in the varsity lineup, eventually was promoted to the first line. 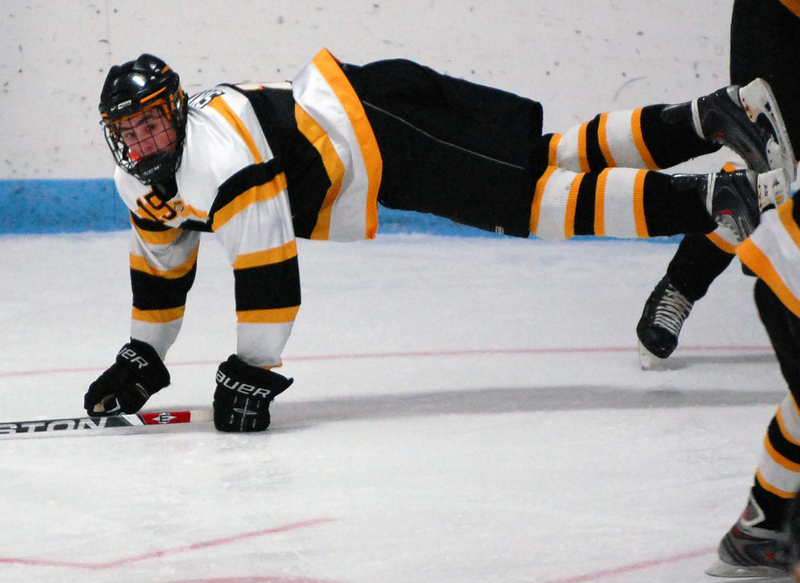 Dupre has stuck with the varsity thanks to his speed and tenacious backchecking, both of which led to his first varsity goal against Bloomington Jefferson on Saturday. "I was backchecking, and the puck kind of popped out and I just decided to turn it the other way. I saw (linemate Adam Smythe) coming down the slot and he was yelling shoot, and the goalie was low so I just put it upstairs." 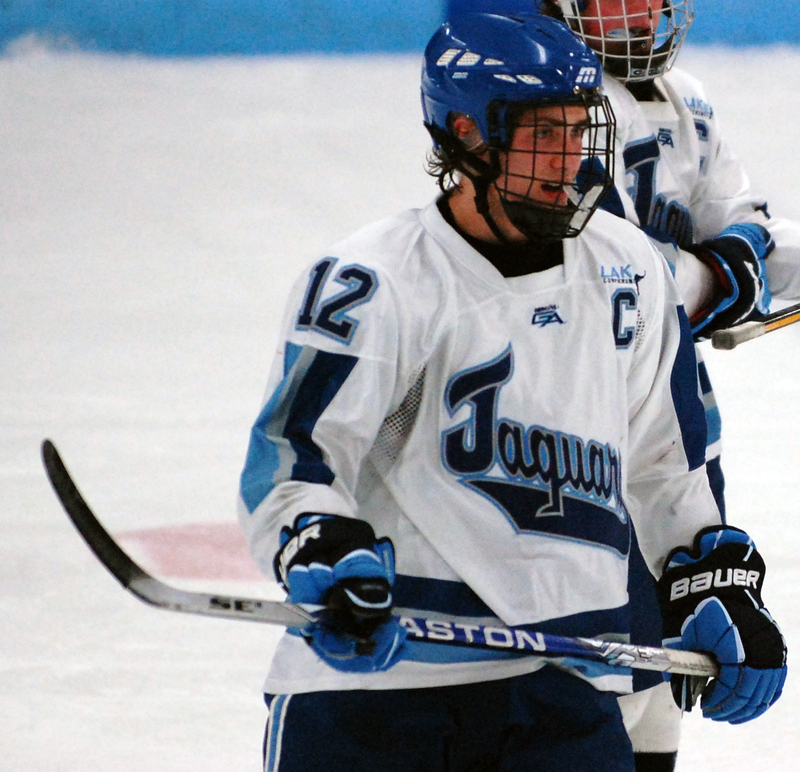 After two periods, Bloomington Jefferson had a 21-12 advantage in shots on goal over Burnsville according to the official scorekeepers, but the Jags had little to show for their efforts. 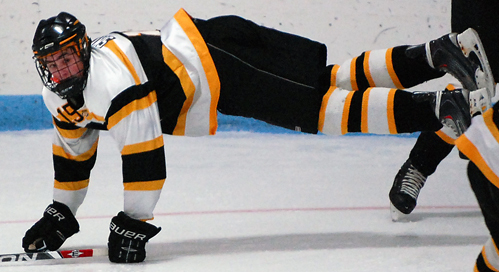 Burnsville, meanwhile, was the definition of opportunistic through two periods, taking a 3-0 lead. 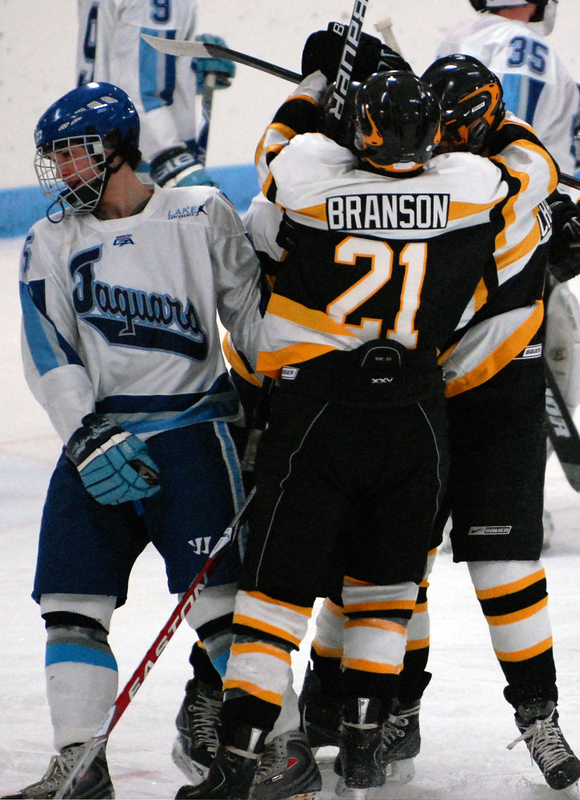 After Burnsville's third goal, a beautiful upper-shelf shot by Aaron Dupre on a 2-on-2, the Jaguars pulled starting goaltender Eric Fabano, a sophomore, in favor of junior Justin Woodley. Fabano had allowed three goals on nine shots. 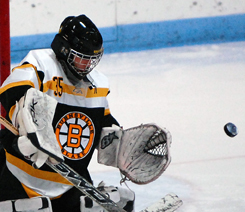 Burnsville junior goaltender Bodhi Engum had six shutouts entering Saturday's game against Bloomington Jefferson. 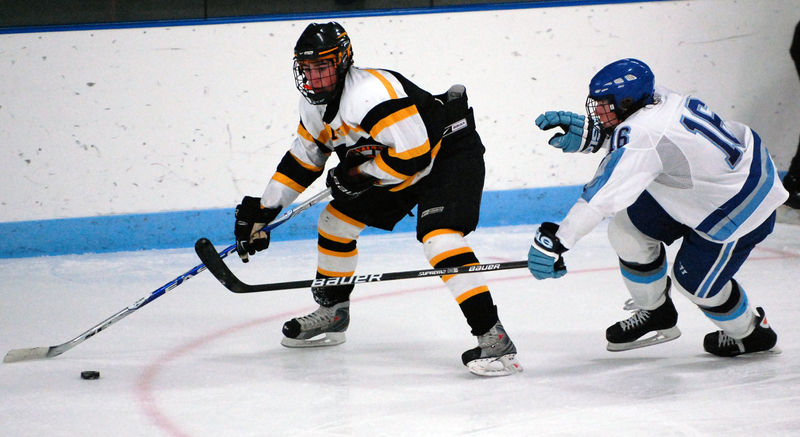 Burnsville had a three-game shutout streak going into the game, having blanked Eastview, Bloomington Kennedy and Rosemount in its previous three games. 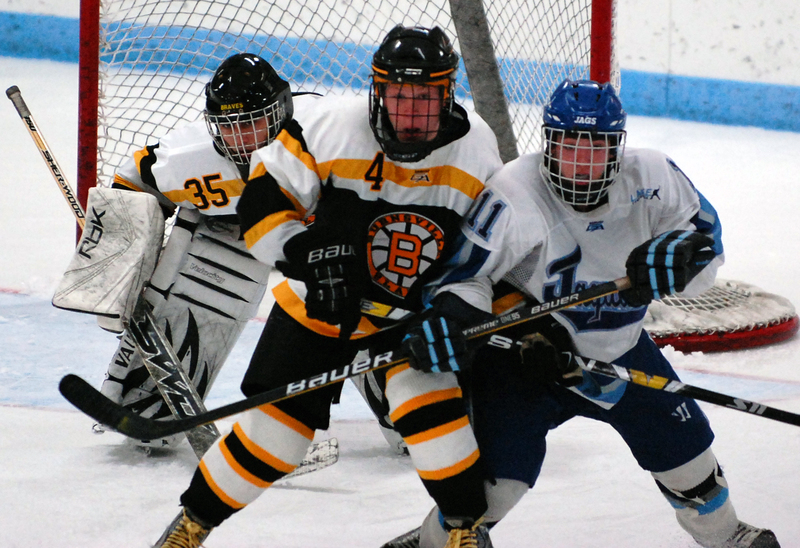 Jack Bunce earned the shutout for the Blaze in the win over Kennedy. 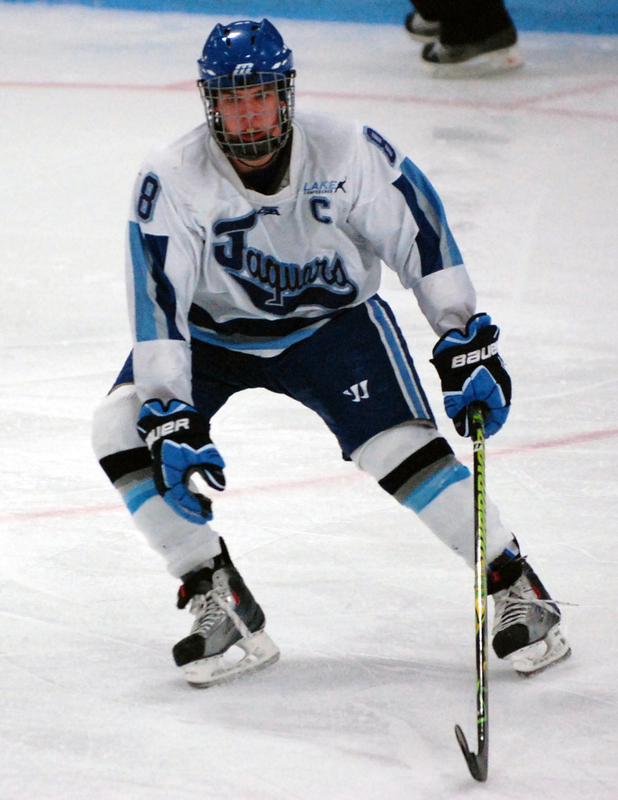 Bloomington Jefferson Mr. Hockey finalist Caleb Herbert finally solved Engum in the third period, drilling a close-range shot into the net during a Jaguars power play. 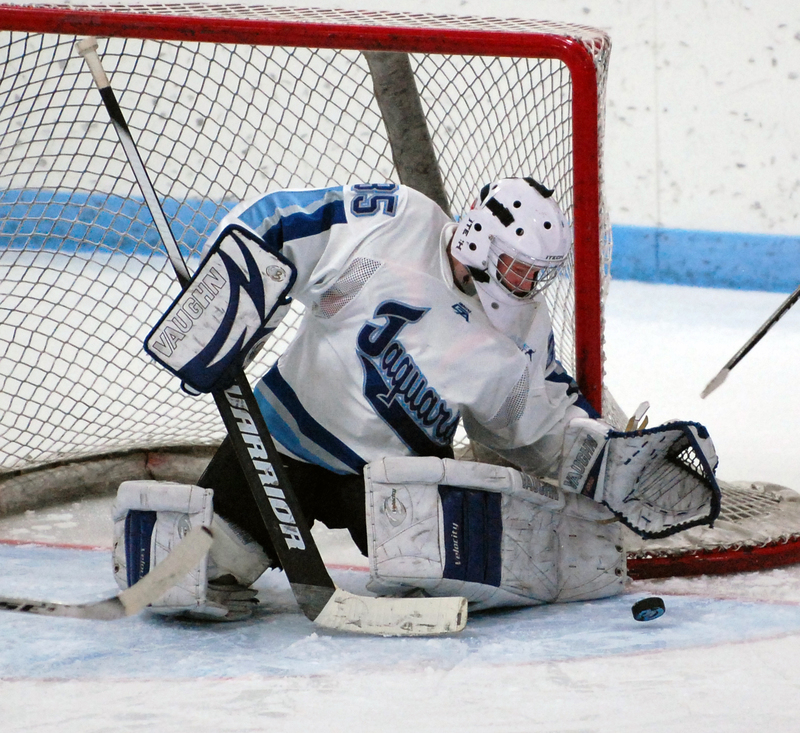 The goal, which came midway through the third, pulled Jefferson to within 3-1. 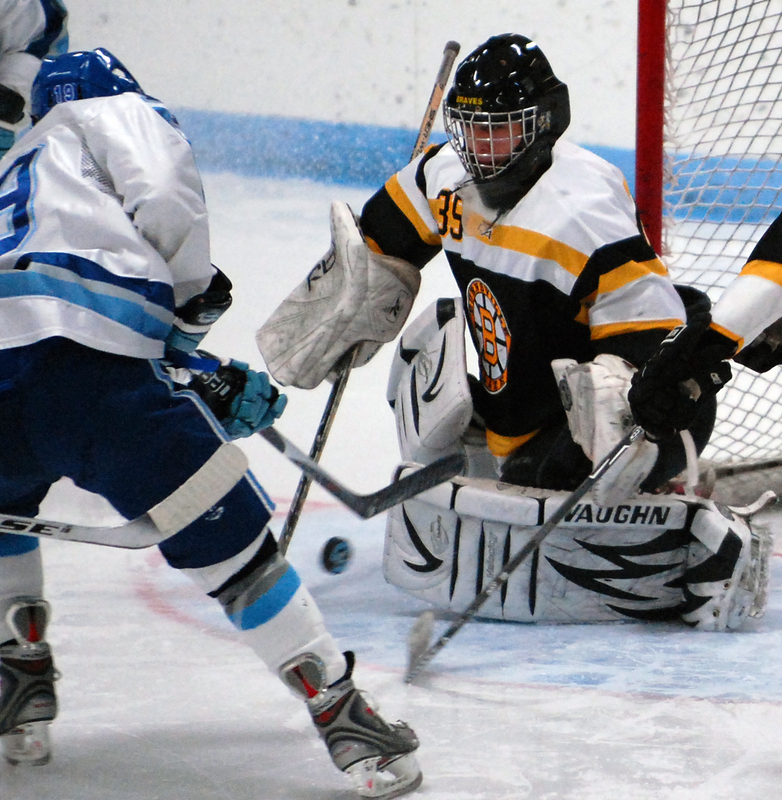 The super-aggressive Engum, who isn't afraid to stray from the net to play the puck, also routinely moves well out of the crease area to challenge shooters. "Since I’m a smaller goalie, I like to come out further so I can cut off that angle more so they don’t have as much to shoot at. 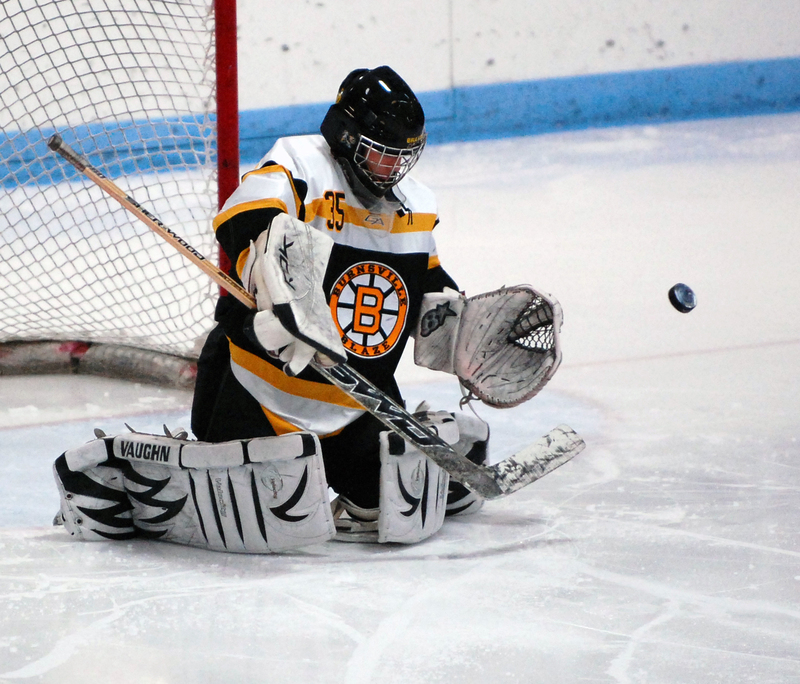 Those bigger goalies are able to stay back, and they have the reaction speed to do that. My size doesn’t allow me to do that." After going winless in his first five starts, Engum has lost just one of his last 13.